Lycopene is a carotenoid that is mainly found in tomatoes products and other fruits. Out of all the dietary carotenoids, it is the most potent carotenoid quenchers of singlet oxygen. Literature suggested that dietary intake of tomatoes and tomato products containing Lycopene has been associated with a decreased risk of chronic diseases. Lycopene is also reported to be a potent hypocholesterolemic agent, antiatherosclerotic, and anti-cancerous. It is useful in the treatment of osteoporosis, dermatology and dental hygiene. It also exhibits antiinflammatory and anticoagulant activity. The antioxidant property of Lycopene is thought to be primarily responsible for its beneficial effects. 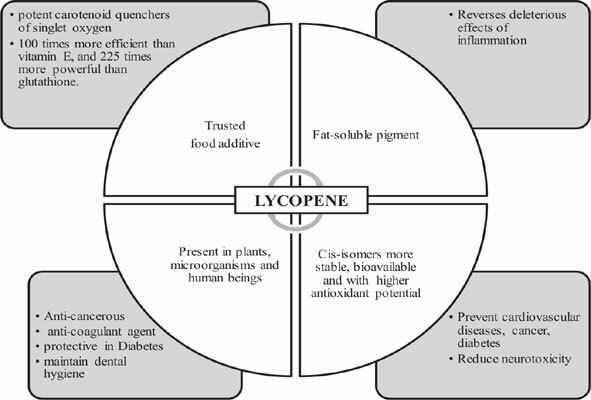 This review showed the understanding and possible pharmacological action of Lycopene in human health and disease prevention. Lycopene, oxidative stress, carotenoid, inflammation, chronic diseases, anti-cancerous.